Modular Systems are a design approach that subdivide a 'system' into smaller parts called modules, that can be independently created and then used in different systems. A Modular System can be characterized by functional partitioning into discrete scalable, reusable modules; rigorous use of well-defined modular interfaces; and making use of industry standards for interfaces. Besides flexibility in design, modular systems offer other benefits such as augmentation (adding new solutions by merely plugging in new modules), and exclusion. 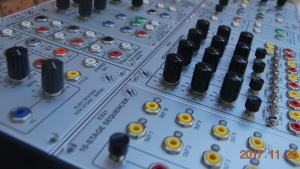 Modular Synthesizers offer the user the musical equivalent to the Modular Systems. Modules such as VCO's LFO's and VCAs provide the building blocks used to build a Modular Synthesizer. A given combination of, amongst many factors, pyhsical dimensions, power supply voltages and inter-module connector types, are known as a format. There are currently 3 major size formats being 3U, 4U and 5U with each of these having various sub-formats.